We’ve gone all creative at FOOTY.COM and added cityscape sillouttes to some of the biggest teams in the game! No Sponsors and a retro feel, what do you think? Any shirt without a sponsor immediately looks much improved. Cleaner, sharper and altogether more beautiful. But what if this area was utilised to highlight the surrounding area of a club? Creating a greater sense of identity and a timeless quality, it would immediately become a shirt fans would be proud to wear for many years. Inspired by the 1990's Newcastle United Goalkeeper shirt (as seen in the header), we take a look at a few examples of fine cityscapes on existing shirts (with added tweaks). La Sagrada Familia stands central. First up, we look at Barcelona's distinctively cyan third shirt. As the centrepiece, it seemed most fitting to have Barcelona's most recognisable feat of architecture - Antonio Gaudi's La Sagrada Familia. A structure that has been under construction since 1882 (before Barcelona FC were founded! ), it's not expected to be completed for some time yet. The outlandish intricacies of the building are perhaps representative of Barcelona's tiki taka style. We polished off the shirt by implementing the ombre graphic featured on the sleeves, along the bottom of the shirt's silhouette. A reflection of Rome's past. 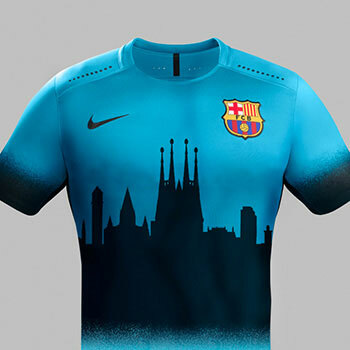 Another third shirt, this Nike design already has symbolic connotations. The dominant grey colour evokes the coat of La Lupa, the she-wolf: a treasured symbol of the club and the Italian capital. Notable features of the Rome skyline are the collusseum and the obelisk of St. Peters Square. 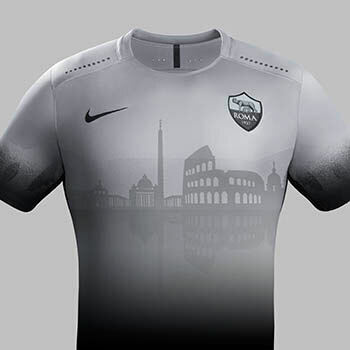 The reflection of the silhouette symbolises the city's historical affiliation with water, through aqueducts and baths, whilst the wolves on the sleeves are a continuation of the colour schemes ideas. One of the World's most famous cityscapes. This concept shirt was designed before the terror attacks in Paris, and thus carries a somewhat heavier symbolic weight. 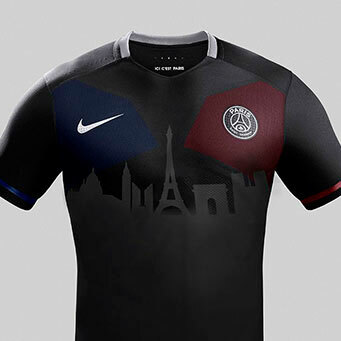 We have used the PSG third kit and added subtle tweaks to a rather simple design. The French Tricolour is used on the sleeve trim and also outlines the Nike mesh panels. The Paris skyline is unmistakable, and of course the Eiffel Tower is the perfect centrepiece to this design. Offering the distinctive symmetrical quality, the structure provides qualities of strength and unity. 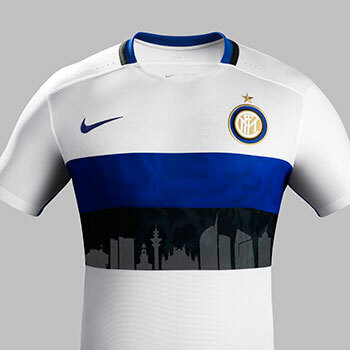 The Inter Milan away shirt is a clean and classy affair. The design already features a subtle black and blue tonal graphic depicting the scales of Il Biscione. Identifiable with Milan since the 13th century, the snake features on the emblems of two of Milan’s ruling families. With the sponsor removed the Milan skyline sits upon the bold, black backdrop. Silhouettes of historical structures such as the Sforzesco Castle and Duomo Cathedral, sit alongside side modern architectural feats such as the UniCredit Tower. With shirt sponsorship deals as ludicrous as ever, a club taking this style is very unlikely to happen for official match shirts. However, what is stopping them utilising them within designs, or as part of official training attire!? Would you like to see shirts possess more originality? Let us know what you think.